Established in 1977, Crown Uptown Theatre inhabits a beautifully renovated, 1920s era vaudeville theatre famously designed by the Boller Brothers - masters of the "atmospheric" theatre. In fact, their original "star lights" still envelop you from the curved, midnight blue ceiling above. Our elegantly remodeled space, expanded bar and stellar service will light up your night. Our venue is also perfect for your next big event. 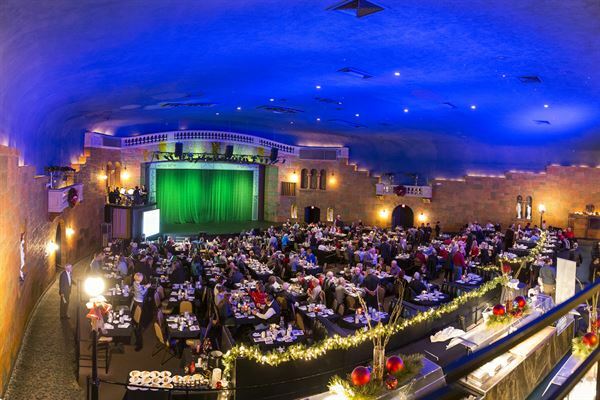 Our theatre has seating capacity for a groups of up to 472 guests in a comfortable tiered table and chair setting with select booths available for added luxury. The Hudson is committed to providing a truly unique experience for whatever your event needs may be. Built in 1950, our values, attention to detail, and unparalleled customer service , are those of a simpler time that is reflected in every aspect of who we are as a company, even the architecture of our facility. We believe in the power of families, colleagues and friends coming together, to celebrate in all aspects : mind, body, and spirit. We are a 350 + capacity event venue located in downtown Wichita in the Commerce Street art district. To give you an idea of the classic style you'll see in our expansive venue... exposed brick walls, arched vaulted ceilings with steel beam rafters, crystal chandeliers, subway tiles, polished concrete floors, and preserved architectural features from Wichita's past. With a new outdoor stage and new 115 space parking lot being built behind our facility, and a one of a kind street art box car, we are THE space in Wichita, KS to host your celebrations.